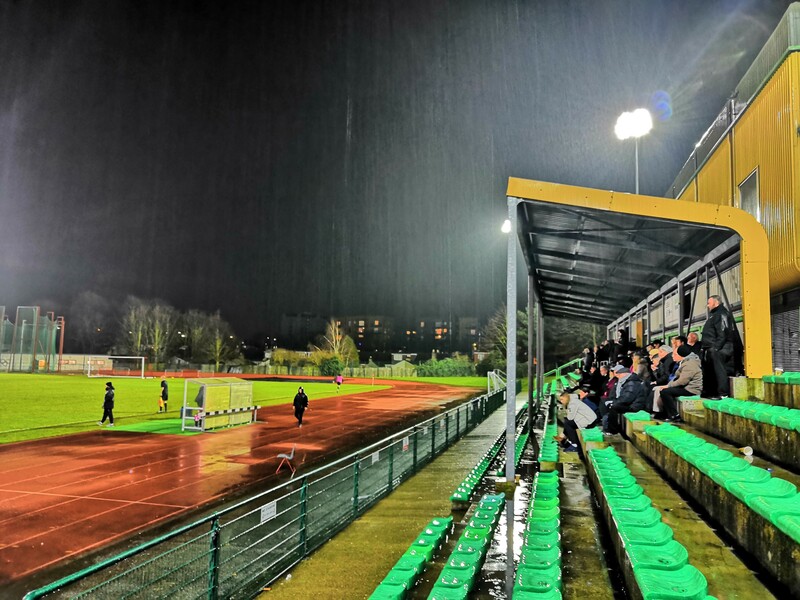 As rain returned to South London, the Fish returned to the Erith Stadium on SCEFL Challenge Cup duty, looking to avenge December’s defeat against Erith Town. With Dan Flemming ruled out after picking up an injury during the Sheppey game (but in attendance to support his teammates! ), boss Dean Harrison included new signing Mike Aziaya in a strong back line. Right from the word go the game looked as it would be another broken down affair, with both sides conceding soft free kicks in early stages. Erith started perhaps the brighter of the two sides, but the first real attempt of the game didn’t come until the 14th minute, a lovely one two between Trey Small and Rob Brown releasing the winger into the box. Small shot low and hard but could only found the side netting. The game burst in to life midway through the first half, as Erith broke forward in a speedy counter attack. Aziaya looked to have the danger covered, but was outpaced by the Erith forward and looked to have pulled him back just inside the box. The referee waved away the home side’s calls for a penalty and the Fish breathed a sigh of relief. From the free kick, the Fish went straight up the other end and very nearly opened the scoring, but Campbell-Palmer’s short range effort scampered wide of the far post. The big forward was looking to carry on where he left off against Sheppey, and it was a lovely turn to create space for himself inside the box. Neither side really found a rhythm in a first half littered with fouls and free kicks, the worst of which saw Pat Geddis floored by the elbow of Aaron Jeffrey, who was spoken to for the foul, but received no further punishment. The wet conditions and heavy pitch were certainly not helping either side. Erith somehow kept three quick fire efforts out, with the Erith goalkeeper performing well against a Fish front line full of confidence. The best chance before the break saw Trey Small leave his marker behind with some superb foot work (the Fish fans were as befuddled as the Erith defender as to how Trey had beaten him, and were left looking in vain for the non-existent slow motion action replay to see Small’s trickery again! ), but a heavy cross couldn’t find Kasai who was bursting in to the far side of the penalty area. In the second half, Dan Wheeler was called in to action a number of times to claim long balls and crosses into his box, and his handling was nothing short of immaculate on a night which can’t have been easy for the keepers given the rain. The game continued in much the same fashion as the first, and Dean Harrison made changes looking to add pace. Kasai was replaced shortly after being booked, with Mathieu Ramsamy coming on in his place. The change had the desired effect as Ramsamy continuously caused problems down the wing, linking well with Hamill going forward and forcing some solid defending from the hosts. Aderonmu replaced Campbell-Palmer for the last 20 minutes, and linked well with Trey Small and Ramsamy to create more of a threat on the break as pressure continued to build on the Dockers’ back line. However, the half was lacking clear cut chances for either side, and the Fisher faithful’s thoughts began to turn to extra time. Just when it looked like the deadlock would not be broken in the regulation 90, a well worked corner routine was cleared was cleared away by Erith in the 86th minute, but a fast follow up move released Mott on the right hand edge of the penalty area. His excellent low powerful drive into the bottom left hand corner opened the scoring, and was enough to see the Fish progress to the Semi-Final. For the second game running, the Fish took the spoils thanks to an 87th minute winner – long may it continue! It’s testament to the grit and determination of this side, which has adapted so well to life back in the SCEFL Premier Division and has developed an invaluable knack of finding a way to grind out a victory even when it looks least likely!